Today’s society is diverse in many ways and is growing ever more diverse by the day. But despite our growing diversity, racism is still pervasive in our culture. Racism is an issue on the minds of many at the moment, but many struggle to discuss it in an open and productive way. The Chamber’s Institute for Healing Racism works to foster a warm environment for attendees to talk about racism with a group of diverse participants. Facing Racism is the Institute for Healing Racism’s two-day program built from the idea that the best way to educate individuals about racism is to simply talk about it! 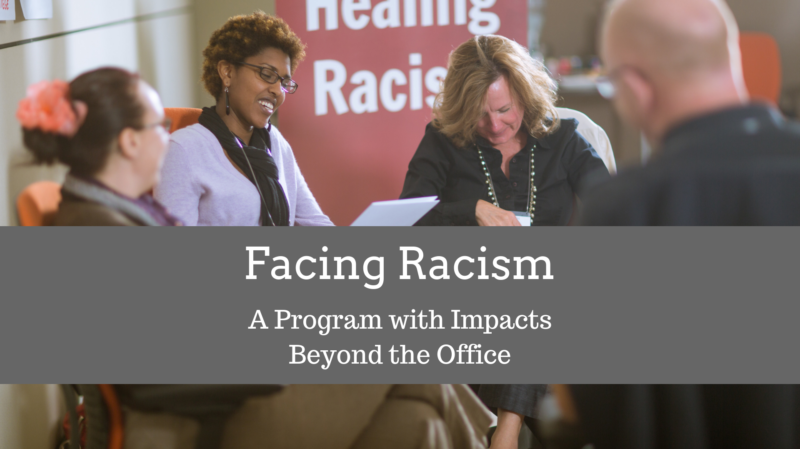 Facing Racism goes deeper than your typical office training program to explore a disease that is still spreading through our society – a disease known as racism. We’re excited to be expanding the program from four sessions per year to six! You demanded it and we’re delivering. What we’re even more excited about is starting in 2019, Facing Racism will now be available for sessions with individual organizations. This wouldn’t be your normal Facing Racism session either – our facilitators will work with organizations to identify what topics they most want to touch on, and right-fit the content to match those needs. Lynn Coursey, a recent participant in Facing Racism, and Volunteer Program Manager at Hospice Care of Southwest Michigan, had a great experience with the program and thinks all organizations should participate if they can, saying, “this program helps workplaces and organizations understand and change processes that exclude diversity, thus creating a welcoming environment with more opportunities for all employees.” Here at the Chamber we strive to cultivate an inclusive West Michigan for all, and building up that foundation starts with education. On why he thinks it’s important to talk about racism, Ken said, “There are a lot of -isms that are hard to talk about, but the more we talk about them, the more we can find ways to combat them.” We agree, and we hope you do too, and will consider joining us at one of our upcoming Facing Racism sessions. Applications for the 2019 Facing Racism program are now open! If you have questions about the program, please email Ken James at jamesk@grandrapids.org. Apr 15, 2019 @ 1:00 p.m.